The PFMC had a few proposals brought to them in the November meeting that should be of interest to us in the Klamath Management Zone area (KMZ). The first request is from the Salmon Commercial Sector and the second is from the Pacific Whiting (hake) fleet to process fish south of the 42 line. In the spring of 2015 the California Department of Fish and Wildlife (CDFW) received a request from the Commercial Salmon Trollers that a new management line be established between the Eureka-Crescent City areas. 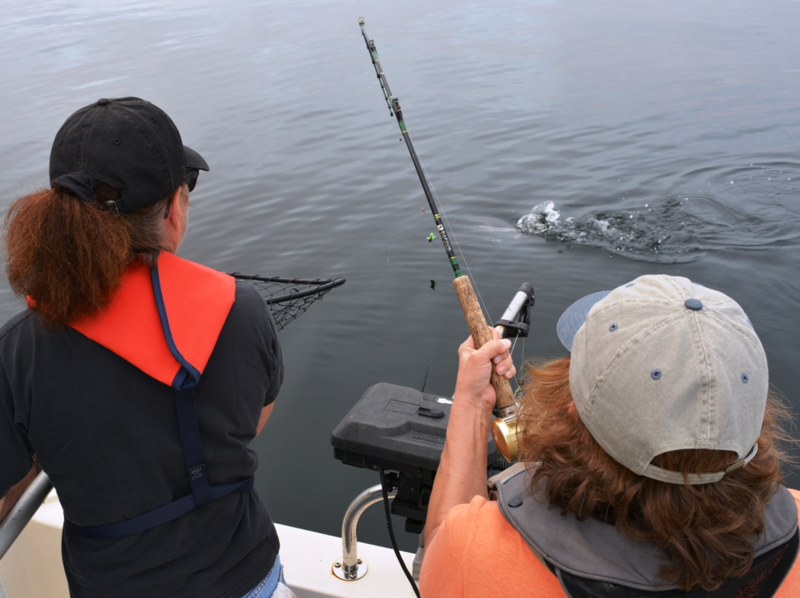 The objective is “a test fishery for industry and management considerations that would examine the hypothesis that salmon distribution and associated harvest rates within the KMZ varies between the areas north and south of the Klamath River mouth”. CDFW proposes that a line at 42d32’48”N be the test management line. That is a point from the mouth of the Klamath River westward. The 12mile exclusion zone still remains around the mouth. The data will be derived from the efforts of the hook and line commercial fleet. Both Genetic Stock Identification (GSI) and Coded Wire Tags (CWT) will be used for the comparison of the data. There is a problem with this since the GSI data is not definitive between Spring and Fall runs and the number of CWT’s returned on any given year is sparse and tends to be much higher from the Eureka area. To receive a statistically valid sample they must have at least 10 CWT’s from each area on a yearly basis. Since 1990 only 600 tags have been returned. Eureka has very little representative CWT data available achieving the 20 CWT minimum in only 6 strata since 1990. On its face, this will be a difficult study since both the proposed zones have such little data being returned. Crescent City has much less return than the Eureka area. Returns are further been hampered by the demise of salmon since the 1990s. But, CDFW is planning to attempt this test fishery to better define the “weak stock” condition of the salmon populations in our area. CDFW data shows the total return of CWT annually since 1990. The variability between the Klamath River Fall Chinook (KRFC) and the Sacramento River Fall Chinook (SRFC) catch data is dramatic. Many years no tags are returned, in other years nearly equal returns from the KRFC and the SRFC are obtained and, at times, the SRFC has multiples of return over the KRFC. In total since 1990, the SRFC is about three times the tag returns from the KRFC. The full report can be viewed at the pcouncil.org site: Agenda Item D.2. Attachment 5, November 2015, CDFW report. The second issue is a proposal by the Whiting Fishery Mother Ship (MS) Sector to allow processing of whiting below the 42 d line (CA/ORE Border). Currently, the Whiting MS sector cannot process south of the 42 line. This was established back in the 1990’s out of concern for salmon by-catch. Currently, they can harvest fish in the CA area, but must haul their nets back up to the border so the MS can then process the fish. This request was brought to the Pacific Marine Fishery Council (PFMC) as an Exempted Fishing Permit (EFP). Due to the difficulty of hauling nets up to the border, they currently only fish about 15 miles south into California. In the discussion there were several concerns brought forward. To go below the 40d 10’ line at Cape Mendocino special permits were needed, so the EFP was amended to stay above this area. Additionally, this involves both State and Federal waters, which would require the CDFW Commission to promulgate new regulations to allow such a test fishery. And of course, the principal concern was the possible by-catch of salmon. The restrictions would be a maximum of 500 salmon by-catch, not to exceed a .05 fish/metric ton of whiting or all fishing would cease. Also, they cannot fish in less than 100 fathoms of water. The Industry representatives discussed this at length in the Groundfish Advisory Subpanel (GAP) and it was moved to the council along with several other EFP’s of varying test fisheries. At the Council level, due to the shortage of staff time, in conjunction with all the other concerns mentioned above regarding salmon by-catch, the request was denied. Thus, it cannot be requested again for another two years. To be certain, there is a reasonable basis for their request. With the new Individual Quota System (IQ) established in 2011 for the trawl fleet, and Amendment 20, 21 and 24 of the Magnasun-Stevens Act (MSA), there are many safe guards already in place to test such a fishery. Their position is that they know how to catch whiting with very low salmon bycatch, and were hoping to be able to fish in this region cleanly without leaving millions of dollars of uncaught fish still in the water. The Whiting Fleet reacts immediately to any by-catch issue and literally can pick up and leave the grounds in an hour if they have excessive by-catch when fishing. But, in the end, the Council ruled against their request, as well as many other proposed EFP’s, primarily based on the interest of staffing time and ability. These requests would put at risk the ability of the Council to meet the deadlines of February 9, 2016 for all requests to be adequately analyzed and put out for public comment in the Federal Register to meet the Spex Cycle for 2017/18. These are just a few of the items that routinely come to the advisory panels of the PFMC and require deliberations and due diligence by the committees and Council. I am not sure of the date when the KMZ Management Zone test fishery will be established. CDFW will probably keep us advised of their progress and timeline for this fishery.